Update March 2019: Click here to view a new dashboard that tracks additional monthly taxi and ridehailing metrics from the TLC. This page will still update, but I recommend the new dashboard for more comprehensive up-to-date data. The New York City Taxi & Limousine Commission publishes summary reports that include aggregate statistics about taxi, Uber, and Lyft usage. These are in addition to the trip-level data that I wrote about previously; although the summary reports contain much less detail, they’re updated more frequently, which provides a more current glimpse into the state of the cutthroat NYC taxi market. I’ve updated the nyc-taxi-data GitHub repository with code to fetch and process the summary reports. The graphs on this page will update every month as the TLC releases more data, though since March 2019, I recommend this dashboard as the best place to see the most up-to-date metrics. 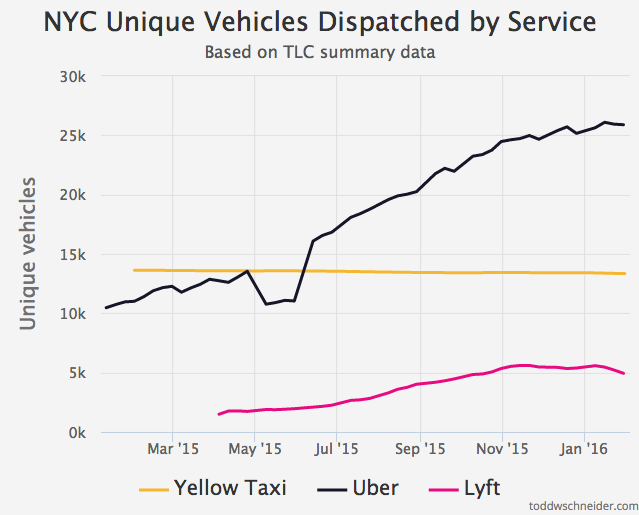 Again this graph will update in the future when more data is available, but as of January 2016 there are just over 13,000 yellow taxis in New York, a number that is strictly regulated by the taxi medallion system. Green boro taxis account for another 6,000 vehicles. Uber has grown from 12,000 vehicles dispatched per month at the beginning of 2015 to 30,000 in January 2016, while Lyft accounts for another 10,000. However, the Uber/Lyft numbers might not be as dramatic as they seem: the TLC’s data does not indicate how many days per week Uber/Lyft vehicles work, only the total number of trips per month and the total number of vehicles that made at least one trip. A study by Jonathan Hall and Alan Krueger reported that 42% of UberX drivers in New York work fewer than 15 hours per week, while another 35% work 16–34 hours per week. If those numbers are true, then a very rough guess might be that about half of those 25,000 vehicles make at least one pickup on any given day. Yellow taxi utilization rates are much higher: the TLC statistics report that the average medallion is active 29 days per month, 14 hours per day (note that multiple drivers can share a medallion). The controversial question is whether the influx of Uber, Lyft, and other for-hire vehicles has worsened congestion problems in NYC. I’ll stay out of that kerfuffle for now, but at least the popular narrative is that the city’s study did not blame Uber for increased congestion in Manhattan. It would be interesting to look at the trip-level taxi data to see if taxi rides from point A to point B have gotten slower over the years in various parts of the city. But even if they have, it would be difficult if not impossible to blame it on for-hire vehicles—or any other single factor—using only the trip-level taxi data. Lyft is probably the most well-known Uber competitor, but there are others. Via, Juno, and Gett are among the newer ridesharing services to operate in NYC, and they report data to the TLC too. Update 4/26/16: apparently there was a data reporting error between Lyft and the TLC in January 2016, which has now been corrected. 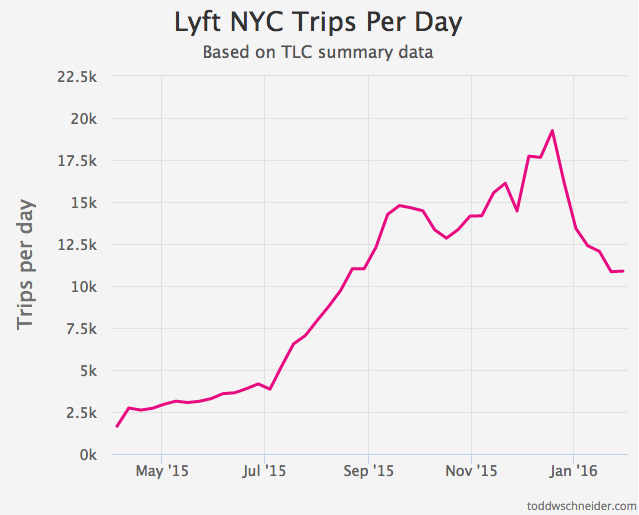 When I originally wrote this post, the Lyft graph looked like this. Based on the revised data, it does not appear that Lyft usage declined in early 2016. That gives us (36.3 * $25 * 0.22) = $200 million estimated revenue for Uber in NYC in 2015. UberX’s recent NYC fare cut will probably increase demand for rides while lowering the average fare. Simultaneously Uber might charge higher commissions, and who knows how surge pricing trends might evolve. I doubt we’ll see too many public data points surrounding revenue, but maybe there will be enough to continue the “rough estimate” game. It will be interesting to see what happens in 2016. 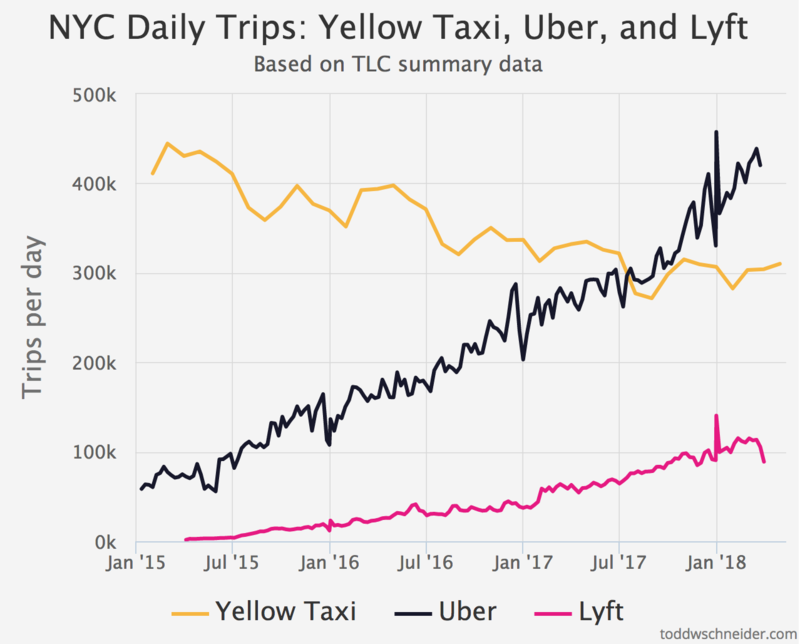 Like many New Yorkers, I’ll be curious to see if Uber continues to gain market share, if yellow taxis do anything to stanch their wounds, and if Lyft—or any other newcomers—can muscle their way into the ranks of the major players.